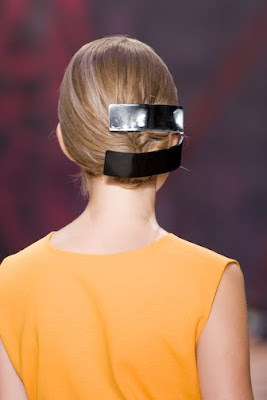 If you're looking for a chic, easy-to-wear, hairstyle (that isn't the typical ponytail), take note of the beautiful crisp looks that Bok-Hee and the Antonio Prieto Salon styling team created for the S/S 2011 Cynthia Rowley runway show. The team came up with shiny, sleek and tight, structured updos. Aura Friedman and the Wella Professionals color team incorporated hand-painted iridescent metallic hair extensions which gave a beatiful sheen to the hair as they came down the runway. gave the final hair look a modern street style with a hint of polished glam. 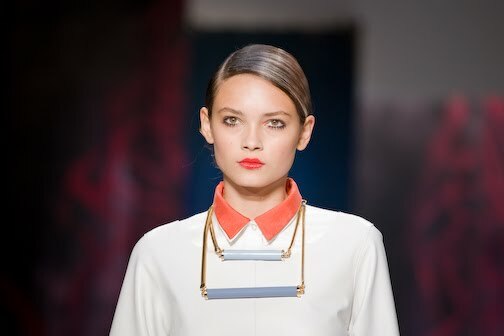 CREDIT: Haircolor by lead colorist Aura Friedman for Wella Professionals; Hair by lead stylist Bok-Hee for Antonio Prieto Salon; Styling products provided by Wella Professionals Styling. Images courtesy Wella Professionals.